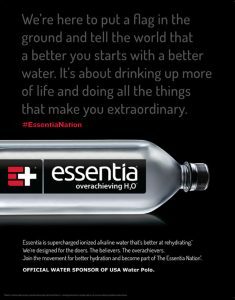 As your USA Water Polo Southeast Zone Chair, I have been graciously asked to offer you a very unique opporuntiy to participate in a special event to support a charitable organization dedicated to all teaching children how to swim and be safe in the water . 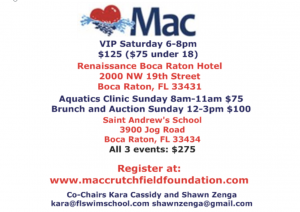 Florida Swim School is the proud recipient of the 2018 grant from The Mac Crutchfield Foundation. Funds from this grant provides free swim lessons to children in local group homes, orphanages, and other children’s organizations. This year is the 11th fundraiser and the first time in Boca Raton. 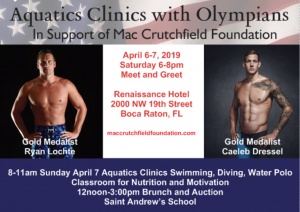 The weekend of April 6-7 will include VIP Meet & Greet with Olympians, Aquatics Clinics with Olympians in swimming, diving, and water polo, plus a brunch and auction. Attached is event information for your to share. The Mac Crutchfield Foundation was set up to honor the life and passion of Mac Crutchfield. Mac tragically drowned while playing in a downpour near his home. Mac was a dedicated and accomplished swimmer. In order to keep Mac’s passion and memory alive, his family established the Mac Crutchfield Foundation. There will be a number of function provided here and you are encouraged to be apart of any or all of these. Join us to help save lives! Event/Tournament Promotion: The value is for this is to provide a platform for the publication and promotion of your event. The costs is $25.00. placed on the Zone Calendar. featured on the SEZ website. emailed to the entire Zone, access to over 2,400 members, all water polo players and stakeholders. Zone Update: As a Zone we have one source of revenue, our Southeast Zone Summer Classic Tournament that was established two years ago. We need other avenues and thus we have established our “Zone Store” and the “Events Promotion” page. These two items are small and as a board we are working on other ideas and concepts. One goal we are working towards is planning our 1st Annual Southeast Zone Summit. This will be a weekend event that brings together coaches, athletes, and referees from across the country to participate in coaches development, referee school as well as a players clinic. All wrapped into one weekend away from any other conflicts. This is still in concept phase and as we begin planning a date will established soon. 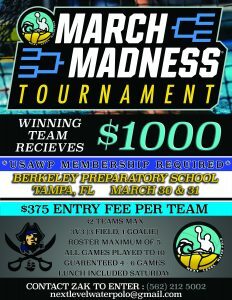 Another source of revenue is to establish a national level tournament that will be sponsored by USAWP and regarded on the same level as the ones we see in other Zones. Justification for these income stream is to utilize the Zone money to establish, scholarship and grant programs that will assist players and teams with the costs involved in chasing those Olympic dreams!! USA Water Polo Zone Chair Summit, General Assembly, and Development Summit: Starting the afternoon of Friday January 25 through Sunday January 27, members of the Southeast Zone Board participated in the Zone Chair Summit, General Assembly, and Development Summit. Highlights from the Zone Chair Summit and General Assembly included discussions around Junior Olympic tournament competition and roster deadlines, improving communication among the Zones, adoption timeline of the new FINA rule changes ([posted on our website), a review of updated SafeSport Policies, and increasing the USA Water Polo board from 15 members to 20 members. The Development Summit included a wealth of interesting and useful sessions ranging from mentoring athletes and creating a good team culture to proper goalie training. All these sessions will be available on USA Water Polo’s website soon. The General Assembly videos can be found at https://usawaterpolo.org/sports/2018/12/19/community-events.aspx#general or USA Water Polo’s YouTube channel. There is a SE Zone shout beginning around minute 36 of session one. 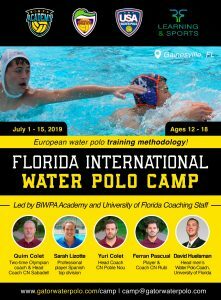 BIWPA, Gator Water Polo, and RF Learning, and the University of Florida, sponsored by RYTE Sport are excited to bring an amazing camp opportunity to the east coast of the U.S. We are inviting athletes from all over the world to partake in camp this year. Coaches will be teaching the best techniques of European Water Polo mixed with the best of the US. 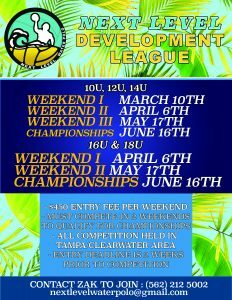 We also have an incredibly low coach to athlete ratio, and some of the best coaches in Europe, as well as the U.S. We also have some really fun Florida based excursions planned for campers. The 2019 Florida International Camp, hosted in Gainesville, Florida. Come join us this summer for the camp opportunity of a lifetime! Play Water Polo…For Life!